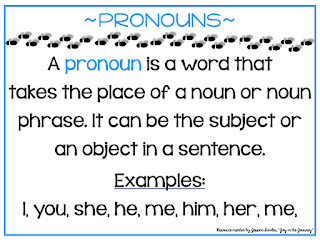 Call me a dork, but I LOVE teaching grammar. I think it's very important that students learn to articulately communicate their thoughts and ideas. 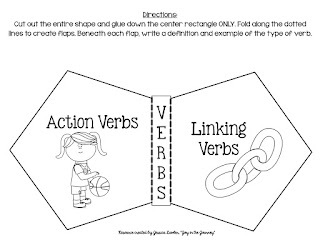 I love charting parts of speech, singing songs and chanting chants, identifying the different types of sentences, diagramming sentences, correcting fragments, listing examples, etc. They have many things hundreds of things they'd rather do than open their English workbook each afternoon. 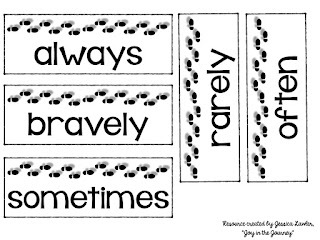 So last year I worked diligently to make grammar fun and accessible - to show my kiddos the necessity of mastering the mechanics of the English language and providing them with opportunities to succeed and build confidence. 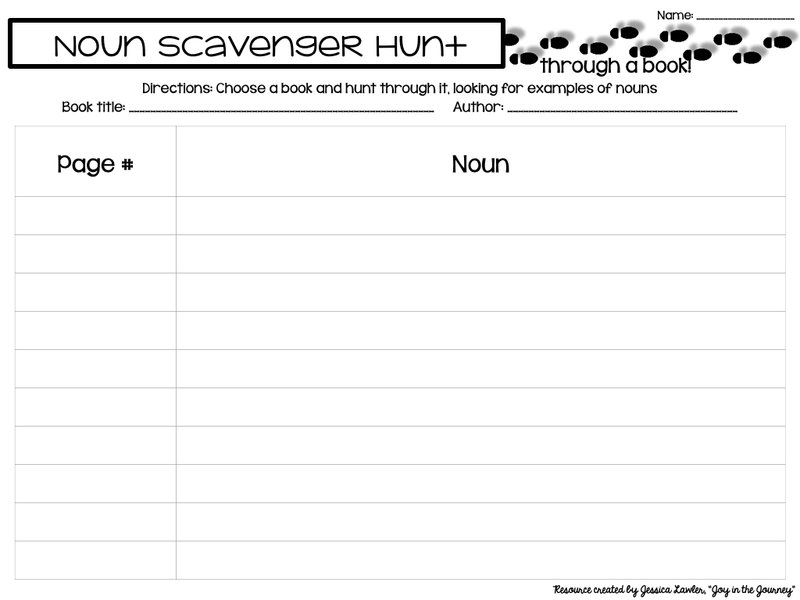 One thing I've done that has really gotten kids excited about grammar and given them good practice/reinforcement is sending them on scavenger hunts and through books to hunt down the different parts of speech. 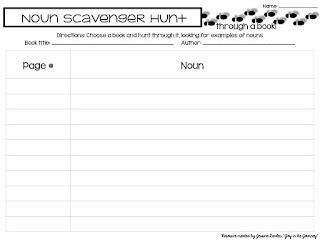 I created the first packet (Pronoun Scavenger Hunt) because I was tired of answering "what's a pronoun again?" It was a huge hit, so as we progressed through the year, I made hunts for each part of speech that we studied. 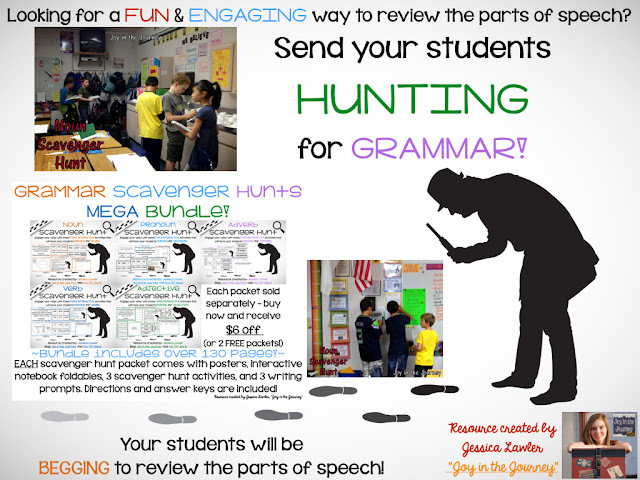 So put down those boring old worksheets and send your kiddos HUNTING for GRAMMAR! 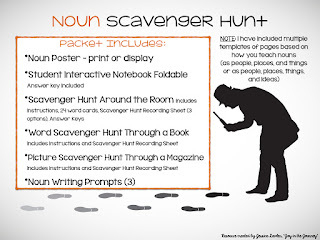 These scavenger hunts will revolutionize how you review grammar. 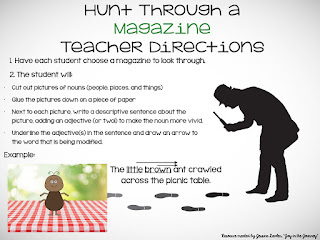 Give your students an authentic, tangible way of differentiating between the parts of speech! 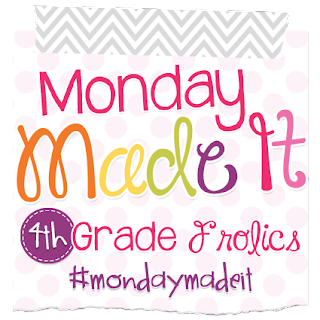 I've worked hard this past week to give these products a MAJOR FACE LIFT! If you already own any of them (or the bundle! 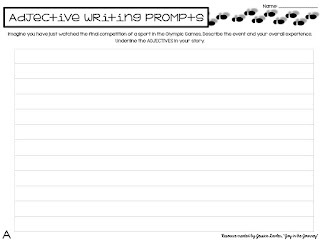 ), you'll definitely want to re-download for fresh graphics, ink-friendly pages, and new original activities included in each packet! Scroll back to the top of this post and PIN the first picture to a board on Pinterest. Then copy the pin URL and leave it in the comments section. 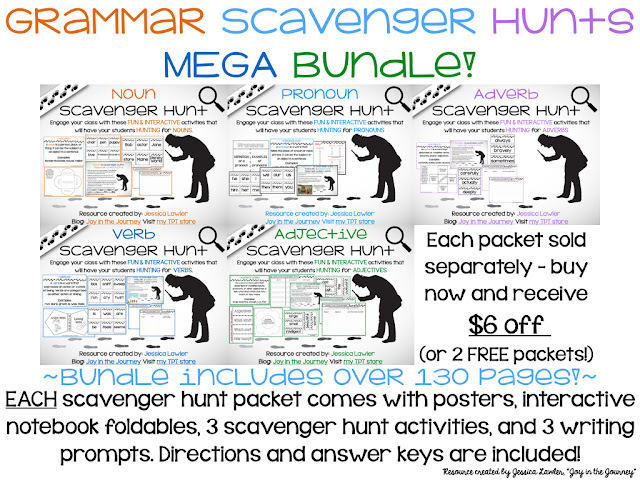 Don't forget to also leave your e-mail address so I can send the MEGA BUNDLE to you! 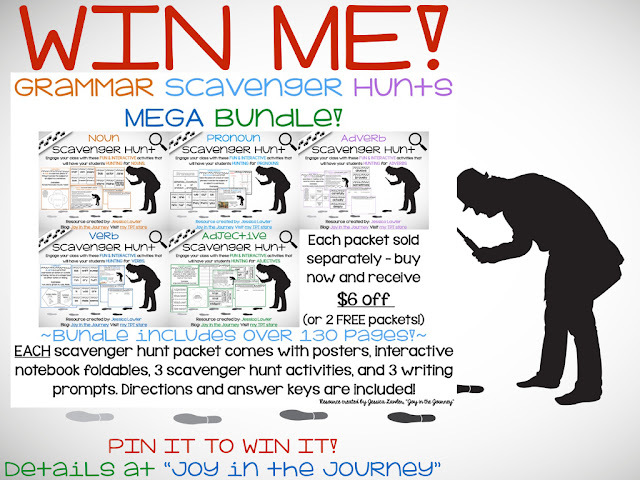 :) The contest will close on Wednesday (7-29-15) at midnight. Thanks to everyone who entered and pinned the product! Congratulations to Brooke @ Smarter Balanced Teacher for winning! Brooke - the packet is on its way!